Khandvi is a savory snack in Gujrati cuisine. It consists of yellowish tightly rolled bite sized pin rolls and is primarily made of gram flour (black chick peas flour) and plain yogurt. Khandvi is readily available across India, and is commonly eaten as an appetizer or snack. Khandvi is usually prepared from a batter of gram flour and yogurt seasoned with ginger paste, salt, water, turmeric, and sometimes green chillies. The batter is cooked down to a thick paste and then spread thinly on a flat surface. The khandvis are then rolled up tightly into 2–3 cm (1 inch) pieces. Khandvi is generally bite-size. It can also be seasoned with spices and condiments, such as grated cheese, chutney, or ketchup. It can be served hot or cold. My son loves this and calls it Ribbon pasta rolls, the name that he must have picked up from a local Indian restaurant. I have been wanting to make this for the longest time, but I remember from my childhood my mom used to make it on stove and had to constantly stir the batter so it does not stick to sauce pan and does not become lumpy. In the process it used to splatter. It was messy. Then someone told me that you can make it in the microwave so I decided to experiment it.. My mom used to spread the batter on back of Thali which is a stainless steel serving plates. I used Silicon mats to spread the batter. I did spread some batter on back of thali. Some people use aluminum foil or parchment paper or some spread it directly on clean granite counter top. Over all it t did not take that long and it was very easy to make, only thing is once you start you can't do anything else in between, except prepare the tempering ingredients. This recipe yields 30 small bite size appetizer rolls, serving for 6. You would need a hand held blender and microwaves safe bowl and a microwave safe cover for it and a microwave of course to cook in. Keep the electric hand held blender plugged in as you would need to blend the batter in between to make the batter smooth, so there are no lumps in batter. Combine flour, yogurt, water, oil, lime juice, asfoetida, salt and turmeric powder in a microwave safe bowl. I used large Pyrex glass bowl. Mix all the ingredients with hand blender until smooth. Microwave the batter uncovered at high power for 2 min. Take it out of microwave and then use the hand blender again to smooth out the batter as you will see thickened cooked batter on side of bowl. Place it in the microwave and cook for another 2 min at high power uncovered. Take it out of microwave and again use the hand blender to smooth out the batter. Repeat this for total of 8 min i.e 4 times cook for 2 min each and smooth out the batter with hand blender in between. Then after you would need to cover it with microwave safe cover, I used silicone cover and cook for 1 min this time and take it out of microwave and use the hand blender to smooth out the batter. Repeat this process for 6 x total, 1 min each time for 6 min total, thus total cooking time was 14 min. Microwave may time differ according to the power. Pour the batter with a big spoon and spread it in to thin smooth layer on mat or back of thali with flat spatula as shown n picture. 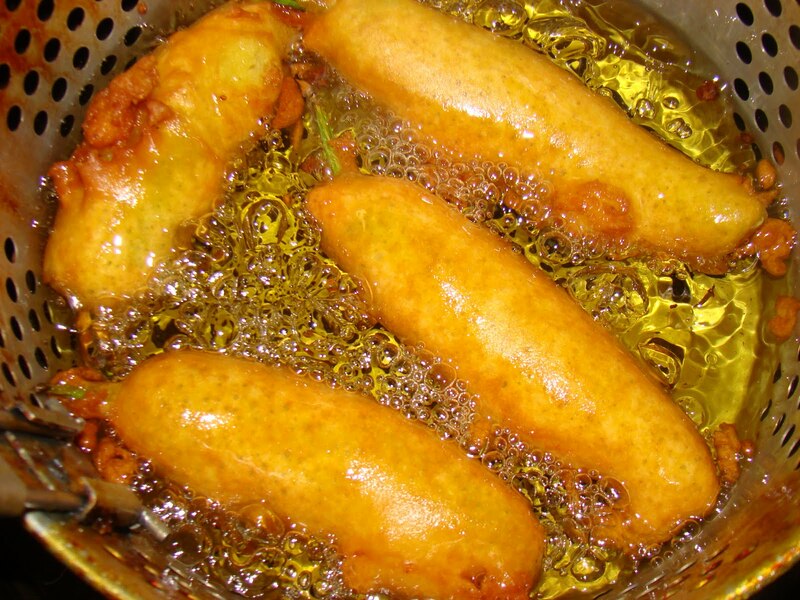 You will see the consistency of batter getting thicker and thicker. In between keep your mats or Thalis ready where you are going to spread the batter. After last min take it out of microwave and test if it is done by place a drop on a flat surface, if it sets, and peels when cool, it is ready. This is the time when you have to do this quickly so the batter does become dry. You can cover the batter in between while you are spreading. Once all the batter is spread in to thin layers on mats. Let it cool for 10 min. In the mean time get all ingredients ready for tempering. Once the spread batter is cool. Cut 2"-3 " strips and roll them in to 2"-3" pin wheels as shown in pictures. Set them in the serving plate carefully. Take the sauce pan off the stove and pour the oil with all the ingredients on to the rolls evenly. I then took out the cooked sprig of curry leaves and chopped them along with cilantro. Garnish the pinwheels with chopped curry leaves, cilantro and shredded coconut. Do not toss of mix the the rolls as it will break apart the delicate pin wheels. I then cut each pin wheel in to two half thus giving me 1 -1.5" pinwheel which is more bite size for appetizer. Serve them hot or cold with cilantro chutney or just plain. Recipe adapted for microwave by Surekha from her mom Mrs. Kasturben's recipe that was cooked on the stove top.